This wasn’t an assignment in the Prairie Primer, but I like to ad lib. 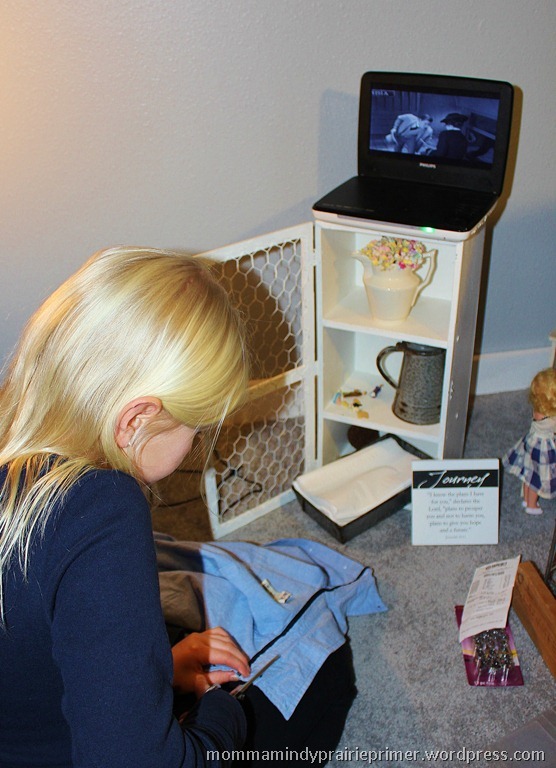 We didn’t want to grow germs and bacteria and disgusting things, but we love sewing and creating to help relive those days. 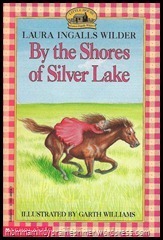 We read Laura’s description of the shanty camp at Silver Lake. It spurred us on to finish a project we’d been planning. 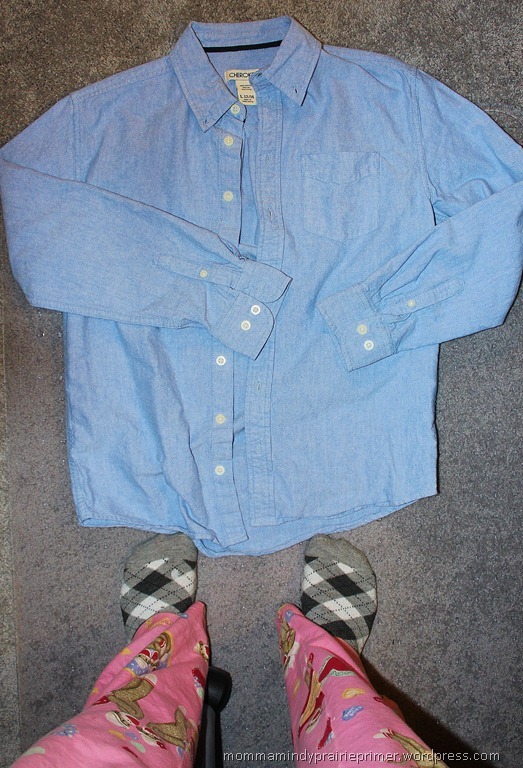 During Christmas vacation, I was minding my own business, blog-hopping and wasting a lot of time, when I found a great tutorial by Whitney at Home Delicious for making a Pioneer Shirt. Since the neighborhood kids know they will be playing “Old Fashioned,” as they call it, when they come over to our home, we like to have clothes available for all ages and sizes. We immediately dashed out to Value Village to look for men’s button down shirts. I was shocked that they were $7. Are you kidding? I can get new ones at Target for that price on sale or clearance. Then I told myself to build a bridge and get over it because I wasn’t going to put us in the Poor House for one rash purchase. Yes, I’m still in my pj’s. It’s a Monday, the first full day of our first full week after a wonderful holiday break, and I didn’t want to throw myself too fully into the routine, I might throw my back out. You’ll be happy to know my student was showered and dressed early in the morning, like a good student in the Gifted and Talented Program should be. At this rate, she’ll probably be the Valedictorian, but ya’ never know. Of course, we’re multi-tasking, because we’re women. We’re watching the movie Miracle Worker about Helen Keller, because we’re learning also about blindness. Beka cut off the collar of the c’mere shirt. It won’t unravel. Using the Ginghers her daddy didn’t use to cut carpeting, snip close to the edge without cutting the band. This is the pair he bought to replace the pair he used to cut carpeting. They’re amazing scissors, since they can cut through carpeting. They’re just not that amazing after you cut through carpeting. Another pair was ruined when an offspring who still hasn’t confessed, tried to cut a wire coat hanger, ya’ know the old kind that were made out of really thick, nice metal strands? But, we won’t talk about that pair, either. 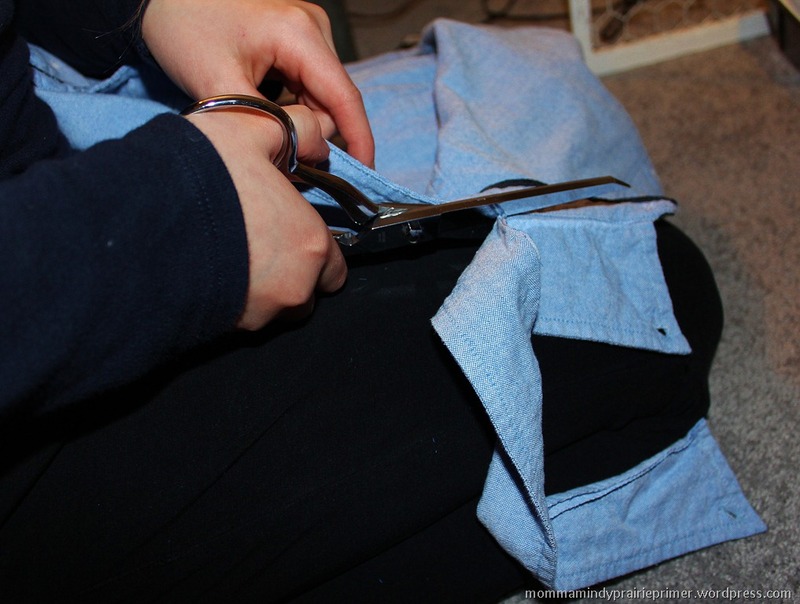 Cut with your surviving scissors across the placket 8 – 12 inches down from the collar. (That’s the side with the buttons.) For a smaller shirt we used about 8 inches, just before the fourth button. 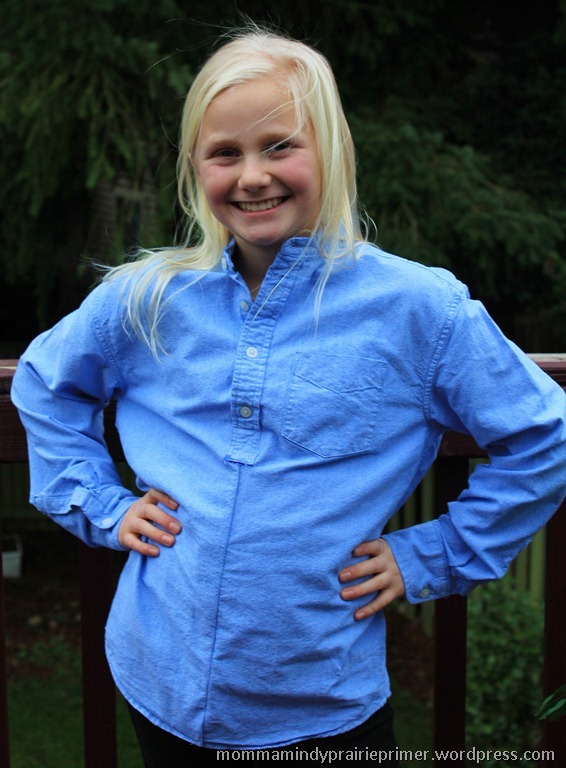 Turn the shirt inside out and put the two seams together to sew. If you’re all fussy, you can iron the seam flat, or just leave it like I did. It’s just gunna’ be thrown into the dress-up box. Beka was a little frustrated because her seam wasn’t perfectly straight. I turned it right side out and showed her it didn’t show. At all. There are times when we’re sewing that perfection doesn’t matter, just gittin’ ‘er dun matters. This was one of those times. I praised her, showed her how even the crookedest place in the seam DIDN’T show, so she should be satisfied. I buttoned the three remaining buttons to line it up correctly. 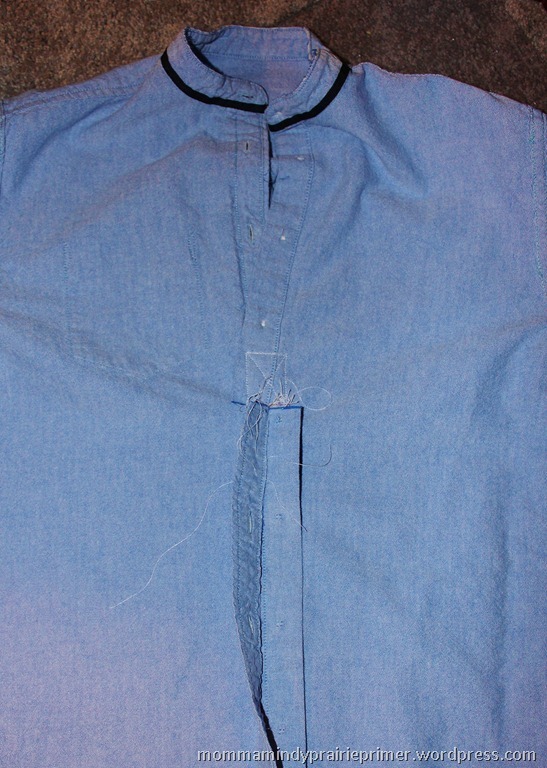 Since we had just cut the placket and sewed it down on the outside, we finished the edge with Fray Check. It’s kinda’ like fixing a run in your nylons with clear fingernail polish. 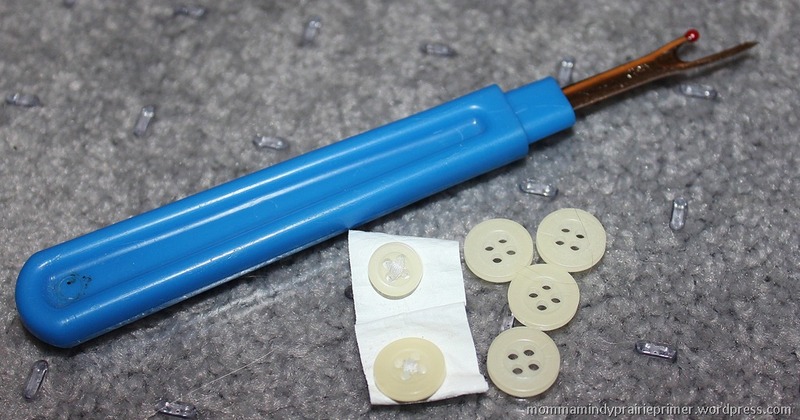 It works great on ribbons and other things you wanna’ cut but don’t want them to unravel. 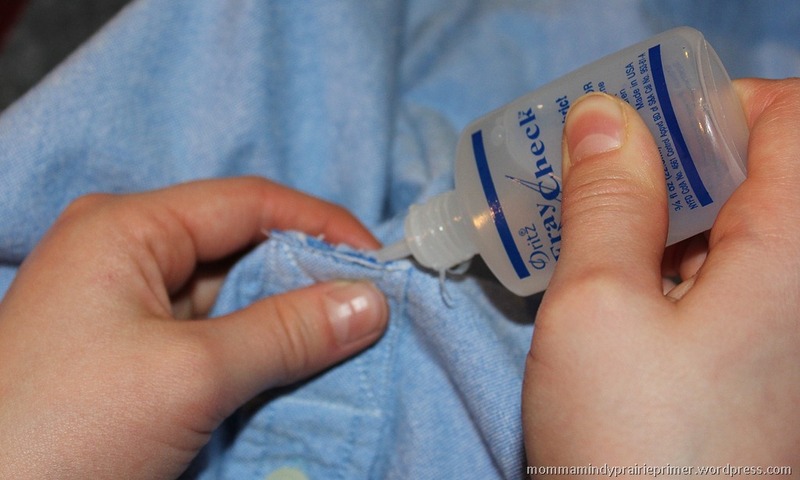 When your Fray Check is older than your child, and it has hardened inside the nozzle, then that said child squeezes and squeezes and squeezes, until it bursts the clump through the nozzle, there could be an accidental SQUIRT and a huge blurb comes out. Maybe that could happen. If it does happen, reassure that child, again, NO WORRIES, be happy, because Fray Check is our friend. It dries clear and you can’t see it, but it might be a little stiff. 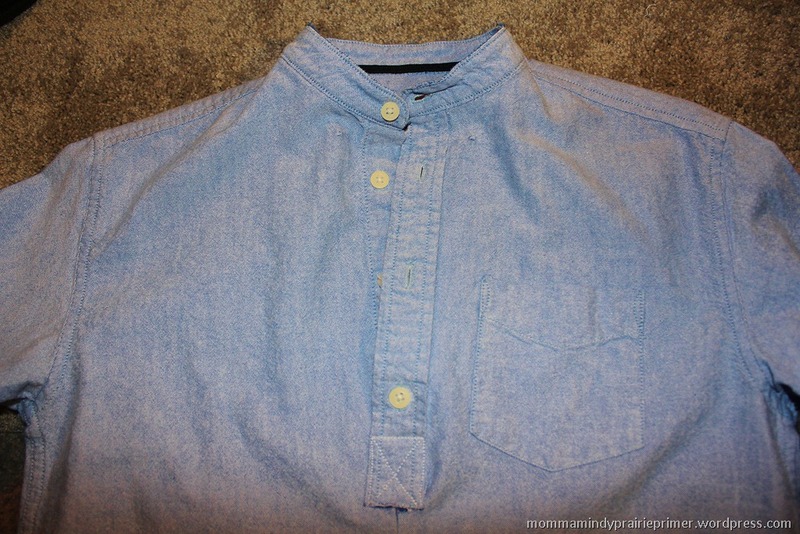 Of course, we took the extra buttons off the shirt and saved them for the button jar. Ya’ never know when we want to make another Button String. We weren’t sure about the sleeves and wondered how we could change them to be more pioneery, but at this point, we were content. It was dun. D-U-N dun. Of course, we’ll be on the look-out for some inexpensive shirts, preferably without the front pocket, to make a few more Pioneer Shirts. If there’s one thing we’re learning through Laura Ingalls’ books, it’s much easier to PLAY pioneer than to LIVE like a pioneer. ‘Cuz if you were a pioneer wearing this shirt, you’d be milking cows, twisting hay for firewood, breaking sod, making homemade pies, cooking dinner over buffalo pies and all kinds of exciting things. We just dress-up, read Laura’s books, research pioneery things on our technology and dream about The Old Fashioned Days.